The Global Volcanism Program has no activity reports for Cerro Auquihuato. The Global Volcanism Program has no Weekly Reports available for Cerro Auquihuato. The Global Volcanism Program has no Bulletin Reports available for Cerro Auquihuato. The Global Volcanism Program has no synonyms or subfeatures listed for Cerro Auquihuato. A young cinder cone, Cerro Auquihuato, lies about 30 km NE of Sara Sara volcano. Along with other, older cones, it is perched on an isolated high plateau far from the nearest roads, east of the Río Ocona. The Cerro Auquihuato cinder cone was constructed along the southern rim of the plateau and fed a pristine lava flow with very prominent levees that traveled southward down a river valley dissecting the margins of the plateau. The Global Volcanism Program is not aware of any Holocene eruptions from Cerro Auquihuato. If this volcano has had large eruptions (VEI >= 4) prior to 10,000 years ago, information might be found on the Cerro Auquihuato page in the LaMEVE (Large Magnitude Explosive Volcanic Eruptions) database, a part of the Volcano Global Risk Identification and Analysis Project (VOGRIPA). Reference List: Morales Rivera et al. 2016. There is no Emissions History data available for Cerro Auquihuato. 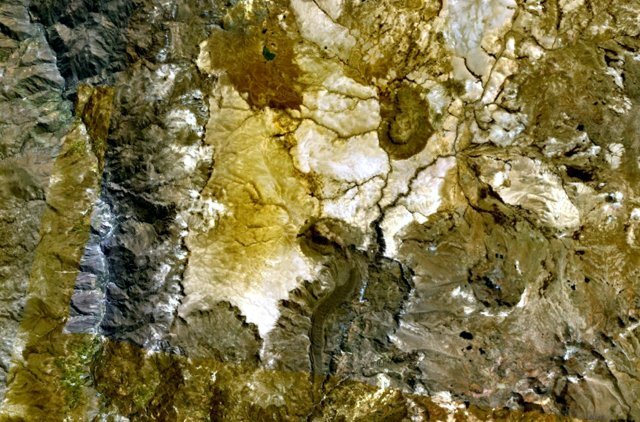 The cinder cone at the margin of the light-colored plateau just below the center of this NASA Landsat image (with north to the top) is Cerro Auquihuato. It and other, older cones are perched on this isolated high plateau far from the nearest roads, east of the Río Ocona (left). The Cerro Auquihuato cinder cone was constructed along the southern rim of the plateau and fed a pristine lava flow with very prominent levees that traveled southward down a river valley and is visible at the bottom-center portion of the image. There are no samples for Cerro Auquihuato in the Smithsonian's NMNH Department of Mineral Sciences Rock and Ore collection. Large Eruptions of Cerro Auquihuato Information about large Quaternary eruptions (VEI >= 4) is cataloged in the Large Magnitude Explosive Volcanic Eruptions (LaMEVE) database of the Volcano Global Risk Identification and Analysis Project (VOGRIPA).